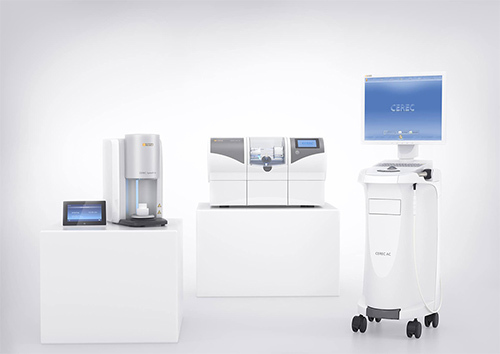 Dr. Woltkamp and Dr. Ross use the latest in advance technologies including CEREC! CEREC technology is revolutionary to dentistry because it creates a beautiful, esthetic, strong and durable ceramic restoration that is precisely bonded to the tooth. It is accomplished using a digital scan of the prepared tooth and creating the restoration’s design using powerful 3D software that allows the dentist to customize the result. The design is wirelessly transmitted to a special milling device that will create your restoration using a dental ceramic. Because this is done in one visit you do not need to have a bulky, messy impression made of your tooth, you do not need to wear a temporary crown and you do not need to come back on a separate visit, often weeks away, to have your new crown placed. It is all done in one convenient visit that lasts a little over an hour. With this technology you can have multiple teeth treated at once to save you time.